10 Years is Worth Celebrating! One of my downline members is coming up on her 10th anniversary as a demonstrator, so I made this card for her, based on Mojo Monday Sketch #494, Simon Says Stamp Monday challenge (We've Got Your Number) and Paper Players #342 (yellow + flower + twine). I used the retiring Affectionately Yours Specialty Designer Series Paper and the Balloon Adventure stamp set (2017 Occasions Catalogue) for the sentiment, which happens to fit very nicely in the Duet Banner punch. The numbers were cut out of Copper Foil Paper using the Big Numbers Framelits. After 11 years working for the same company, I'll be leaving for a new job at the end of this week. It'll be quite a big change, for the better, but saying goodbye to my boss will be bittersweet. I wanted to make a card to thank him for everything that he's done over the four years we've worked together. The Nailed It stamp set (Occasions Catalogue, p. 48 - retiring) includes a sentiment in the French set that says "De main de maître" - it loosely translates to something like "From the master's hand." My boss is a lawyer and in French, we put "Maître" in front of a lawyer's name, so the play on words is perfect for a card for him. 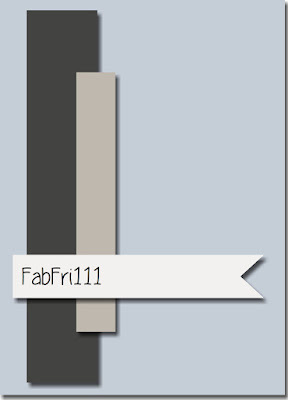 The design was inspired by Fab Friday sketch #111. I knew I wanted to make a moving card with the cute piñata image from the Year Seven stamp set. When looking through my paper scrap drawer, I found this old patterned paper that seemed like a good match, and I used my fringe scissors on matching cardstock and some old pompom trim to go with the fiesta look. The sentiment, from the Label Love French set from Altenew, reads "Let's Celebrate." My 4½-year-old niece is obsessed with this card and plays with it every time she comes over to visit me. She's really into crafting these days so she's drawn to my craft room whenever I babysit for her at my place. We've been crafting up a storm lately. I wonder if her interest in crafts will persist. In the meantime, I definitely enjoy passing on my knowledge to her. The fact that the dies that come with the Two Feet Deep stamp set include holes to add stitching on the snowshoes is a pretty cool way to add texture to a card. Being a cross stitcher, I'm always happy to add a bit of needlework to a project. This card was inspired by the Freshly Made Sketch #185 and an old ColourQ Combo (#310). I pulled out some of the retiring items from the current Stampin' Up! catalogues. I'm a bit sad that the Fresh Fruit stamp set is retiring after only a year, I thought this one was fun and whimsical (it was one of the first thing that grabbed my attention during my first leaf through of the catalogue). 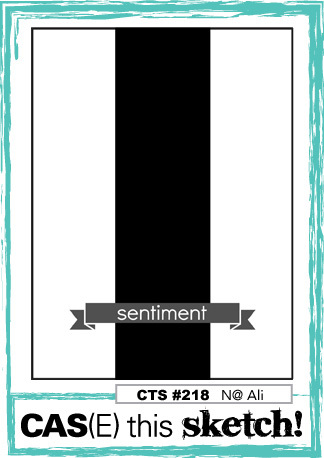 I selected a sentiment from the Iconic Expressions hostess stamp set, which reads, "Time is long without you." I thought it went well with the lemon, in a "when life hands you lemon" kind of way. The background was created with a piece of paper from the Fruit Stand Designer Series Paper and I added some Sprinkles Embellishments on it since the colors were matching. The Stamp, Ink, Paper Challenge #96 called for a Clean & Simple wedding card. The retiring Iconic Occasions hostess set includes a few wedding-related images and sentiment so it was a good opportunity to get it inked again. I used the Diagonal Stripe background stamp on the card base (Thick Whisper White). I also used the retiring Mint Macaron color. It was my favorite colour from the retiring In Color palette. I'm going to miss this one. This card was inspired by TGIF challenge #104 (Polka Dots). I paired a bunch of old paper scraps together to create my own colour combo, two of which include small and big polka dots. The washi tape I used on the seam between the two papers also have copper dots on it. The seniment comes from the Label Love French stamp set from Altenew. A matching envelope was made out of another green paper leftover. Altogether pretty simple, but cute. Seeing the banner on the CAS(E) This Sketch #218 inspired me to ink up the Balloon Adventure stamp set. 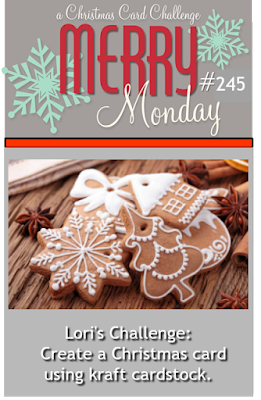 I was looking for colour inspiration and went digging in my list of past ColourQ challenge and found #328 to be an interesting combo, made of current colours. I will say, Arielle from ColourQ had an eye for always finding the greatest inspiration pictures and turning them into interesting combo. Some I was instantly drawn into, others I was more dubious about. This is one case where I thought, Those three pinks together? Melon with Coral?? But look how pretty the resulting card is. My initial design only included two balloons, but the top of the card looked too empty. I planned on adding part of a balloon at the top, but after placing the full balloon extending over the top edge, I though the card was way more interesting that way. 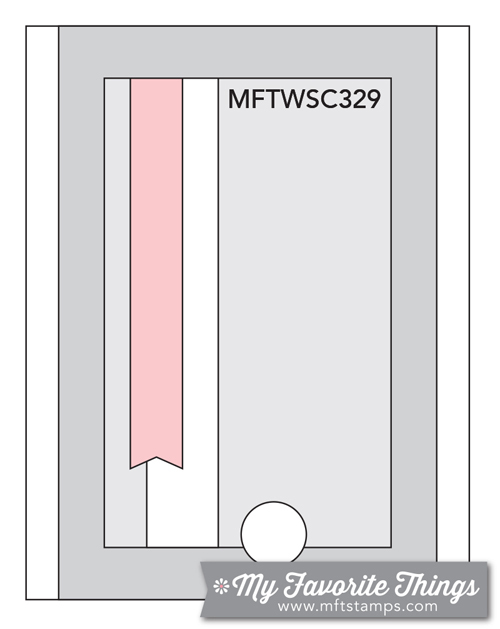 That required a custom-made envelope, though, so using the Envelope Punch Board, I created an envelope for a 4-1/2" x 6" card. 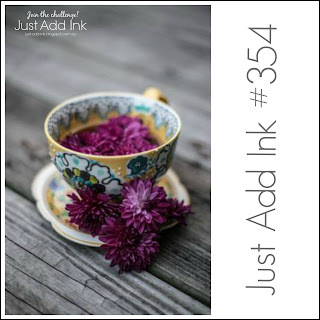 This card is also inspired by the Just Add Ink #356 (I paired metallics and balloons). I found an adorable new series of stamps at my local store called All Dressed Up, which I had never seen before, I couldn't resist, and this is my first card made with them. I thought the MFT Sketch #329 would work well with the tall image. I worked backwards to figure out what card size I would need, and stamped and die-cut the image first, and based off of that, I figured I would need an oversize card. I looked at the envelopes I had and decided to go for a 5" x 7" card. (I was using paper scraps and my biggest leftover piece was not large enough to make an envelope out of. 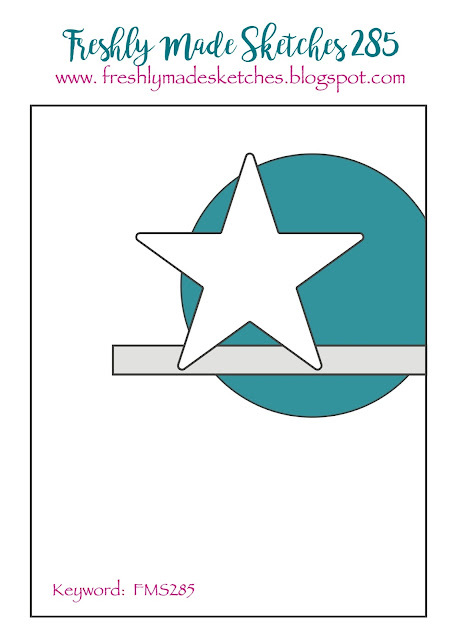 The cute tag was die-cut using the Star Blast Edgelits. I had included these die-cut pieces in a mini-album class, and those were the leftover pieces from die-cutting the two colors of cardstock. They were lying on my desk and I realized that BOTH colours actually fit with my paper, so it gave me the idea of how to include my sentiment on the card. The Stay Strong stamp set seemed liked a natural fit for the Big Top Birthday Designer Series Paper Stampin' Up! carried a few years ago. Based off of the Stamp Ink Paper challenge #95 sketch, I came up with this fun Father's Day card. For the French sentiment, I reached for the Teeny Tiny Wishes stamp set. I embellished with different stars: metallic enamel shapes added to the pennant image on the DSP, stars punched out of Silver glimmer paper with punches, and a metal star from the Urban Underground Embellishments (from the Occasions catalogue - absolutely love those!). My 4½-year-old niece has started to get a real interest for anything craft-related. Every time she comes over to my place, she looks at the projects I'm working on (paper crafts or needlework) and she asks questions and compliments my finished projects. She's been particularly interested in the 3D projects, asking to make her own 3D houses with the Home Sweet Home Framelits (she chooses the colors and embellishments, I put the house together) and she also discovered the Big Shot and now she's obsessed with the embossing folders. This bunny basket was inspired by Simon Says Stamp Monday challenge (HIP HOP). My parents are visiting for Easter and my mom was asking about how I had done a my previous Easter Treat Bag. I grabbed the Gift Bag Punch Board and a scrap of blue cardstock and I started demonstrating how the punch board works. After assembling the gift bag, we actually kept going and I started pulling out images from the Basket Bunch stamp set and the bag finally ended up as a full-blown project! The little polka dot cello bag is even filled with candy and ready to hand out to my sister's in-laws, which will be joining us for dinner tomorrow night. My mom was pretty impressed with the resulting gift bag, so hopefully, they will be too! 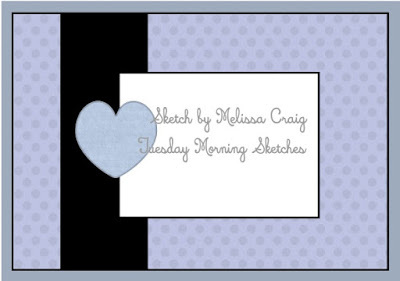 The design was actually inspired by the tic tac toe grid from Stamp Ink Paper #94 (flower + ribbon + light blue). I wanted to put together some Easter treat packages for the colleagues at the office and a couple of weeks ago, I got this flash of inspiration that the Popcorn Box has an angle shape that kind of looks like the top of a carrot. In my initial idea, I thought I could use Fringe Scissors to add some greenery on top of the box. But when I sat down and reached for the Basket Bunch bundle, which I was planning to decorate the box with, I discovered something VERY neat: the little greenery die-cut included in the Basket Builder Framelits dies collection is exactly the same size as the top of the Popcorn Box. Down to the last millimeter. I couldn't believe this lucky coincidence! To give the box its carrot texture, I used the Timeless Textures stamp set on all four sides of the Pumpkin Pie box. 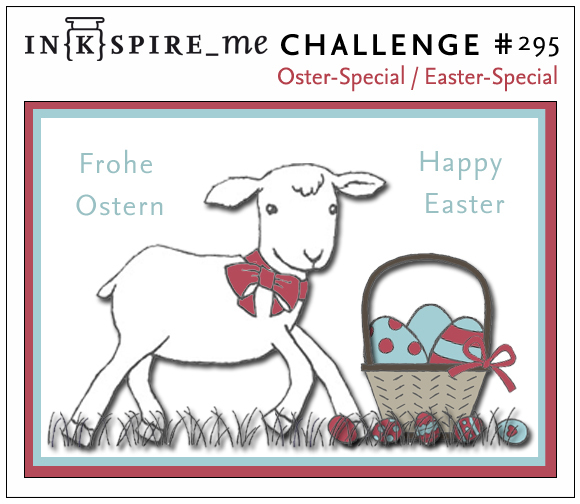 The project was inspired by the In[k]spire Me challenge #295 (Easter) and Stamp Ink Paper challenge #94 (tic tac toe - bunny + ribbon + yellow), as well as from an old ColourQ challenge. I was playing around with the Gift Bag Punch Board, trying to come up with Easter packaging ideas. The color combo was inspired by an old ColourQ challenge (#76) and paired with the Basket Bunch stamp set and matching Basket Builder Framelits dies. I used the Perfectly Artistic Designer Series Paper from last year's Sale-A-Bration offering, which has a nice soft ombre look that works well with the Easter theme. This is inspired by Simon Says Stamp Monday challenge (Hip Hop - with the bunny) and the Naughty or Nice challenge #37 (three die-cut Easter eggs + Easter theme). I needed a masculine card so I decided to pair the Boys Only papers from Doodlebug Design with the Sweet Cupcake and the Birthday Banners stamp sets. None of the weekly sketches worked for the double banner, so I picked an older Mojo Monday sketch (#375), paired with Just Us Girls #388 (multi-step stamping – on the cupcake and on the banner) and Simon Says Stamp Wednesday challenge (Happy Birthday) for inspiration. I'm still putting my KI Memories paper scraps to good use. In this instance, I drew inspiration from Naughty or Nice #38, Just Add Ink #354 (purple shades from inspiration picture) and an old Mojo Monday sketch (#395). Those Exercise Grumplings just make me smile every time I look at time. That frustrated, discouraged look pretty much reflects my own whenever I try to exercise. And "Cardio is Hardio" says it all! For Naughty or Nice's three of something challenge, I added three metal embellishments that reminded me a little bit of dumbbells. I kept the embelilshing to a minimum because I wanted this card to work as a masculine card. The Once Upon a Time paper collection from Echo Park seemed like a natural match with the Fairy Tale Squidgies stamps, with its castle and crown patterns. I also have a sentiment that says, "And they lived happily ever after" in the Big News stamp set from Stampin' Up! (retired), which was also appropriate. Because the sentiment is so large, I had to pick a layout that would accomodate its size, so I went with the Tuesday Morning Sketch #397. The little heart that I gold-embossed and handcut also comes from the sentiment set. The squidgies were colored using Prismacolor pencils, and I referred to the colored image on the packaging to help with my shading (having those colored images included is really helping me improve my coloring skills). The sentiment was embossed in gold to mimick the gold foil on the patterned paper, and I freehandedly pierced a border all around the Deco Labels Framelits die-cut. This card combines challenges APRVSN17B (pink + brown + dog image), Naughty or Nice #38 (three paper squares) TCP Tuesday #335 (Sassy Sentiments) and Freshly Made Sketch #282. Since one of the challenges called for a specific color combo, I went though my paper scraps, which are organized in 12" x 12" plastic drawers, by colors. It made it easy to find what I was looking for. The stripes is an old Making Memories collection, which I remember using on a lot of projects, down to the last pieces, and the other three patterns are from a Stampin' Up! collection, which I can't recall the name of, but all of the patterns were Chocolate Chip and Very Vanilla and I remember also using that pack down to the very last pieces. I used the Stitched Shapes Framelits to die-cut the three squares. 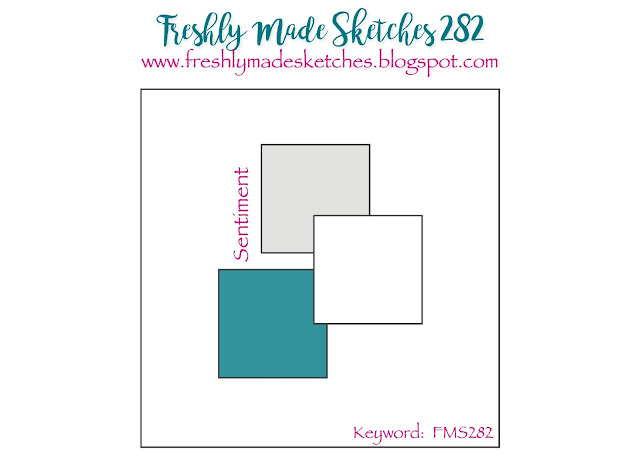 I find that the stitching really adds a lot of dimension to finished designs, so I've been using those Framelits a ton since buying them from Stampin' Up! (They were a great investment!) The sentiment ("Is it Friday yet?") was added vertically, first in brown ink and then overstamped in VersaMark so that I could clear-emboss it. The little Poochie image was stamped in Memento ink, colored and handcut. I decided to ink the edges of the stripes paper so that the contrast wouldn't be as stark, and I used my new Distress Oxide inks (Walnut Stain) to do so. I used the same ink to lightly distress the Pretty in Pink Corduroy brad (remember those?) because the color was clashing a bit with the Blushing Bride pleated satin ribbon I wanted to use. Adding a touch of ink solved the problem. (I've used that trick a few times, seeing that I have a bunch of those pink corduroy accents left and that shade of bright pink is really hard to match). The background was stamped with the coffee-ring image from the Timeless Textures stamp set (a staple in my stamps collection). 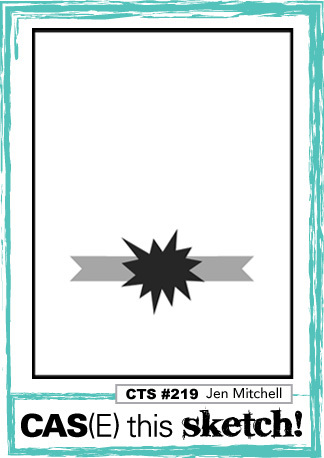 Patterned Papers: Making Memories, Stampin' Up! This card was also born out of fun papers I found while rummaging through my paper scraps. Those papers are from an old KI Memories collection that I had a lot of fun using back in the days, over a decade ago. I paired them with the Mojo Monday Sketch #491 and thought they would look great paired with the penguins having fun taking selfies. By the way, Alma (The Cat's Pajamas owner) will have to explain to me how her penguin hanging in the back manages to make bunny ears when he does not have fingers?! I realized this as I was coloring the image, and now I can't unsee this detail. LOL! 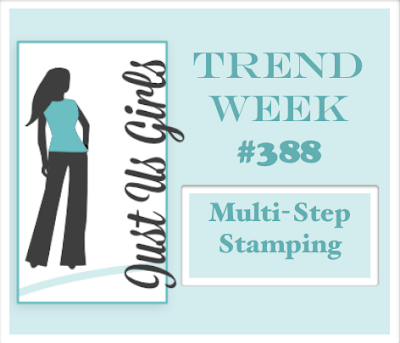 This week's Just Add Ink challenge #353 is centered around critters and Simon Says Stamp Wednesday is Anything Goes. I was looking forward to playing with the Polar Bear Pals stamp set, so I paired it with the Winter Wonderland papers from Simple Stories (I have to say, I'm totally digging that collection - the colors and patterns are really appealing to me). That polar bear is just so cute - I don't know how you can't not smile, looking at its adorable face. The sentiment reads, "Happy Birthday to you" and was embossed in Rose Gold powder.